I know I've been missing from blog quite awhile. Most of you are aware that I'll be like a chipsmore when Hubby is in town...hehe! 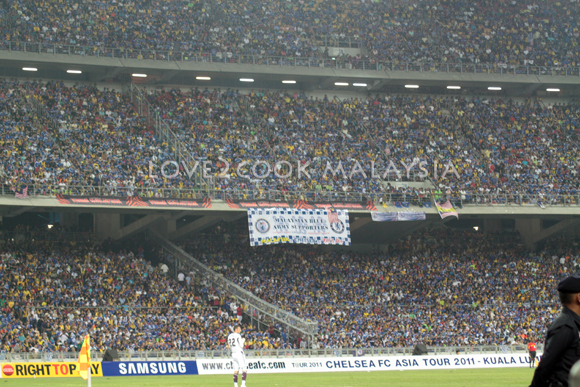 No food post for today...but on Chelsea FC vs Malaysia! I know it's kinda late update, seriously I had no time to spare but still wanna record the special day in my blog...hehe! 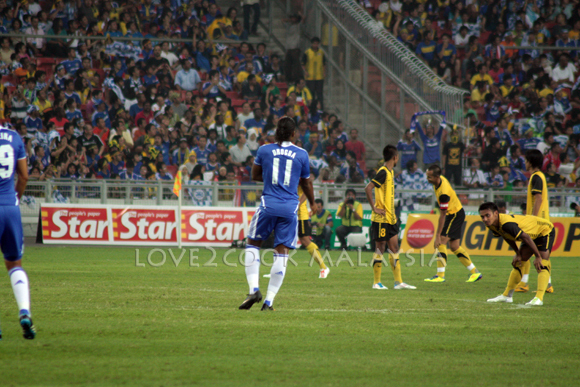 Glad to share some pics shot by my Hubby during Chelsea FC's recent Asia Tour to Malaysia. (He bought a new lens just for the show!!!) 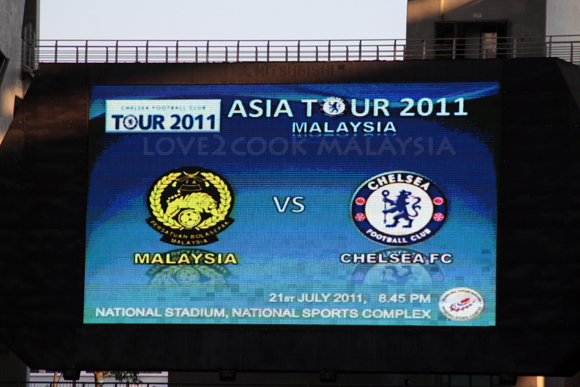 Chelsea FC faced Malaysian team on 21st July 2011 at Bukit Jalil National Stadium. He too never miss the opportunity to witness his stars live training on 19th July. 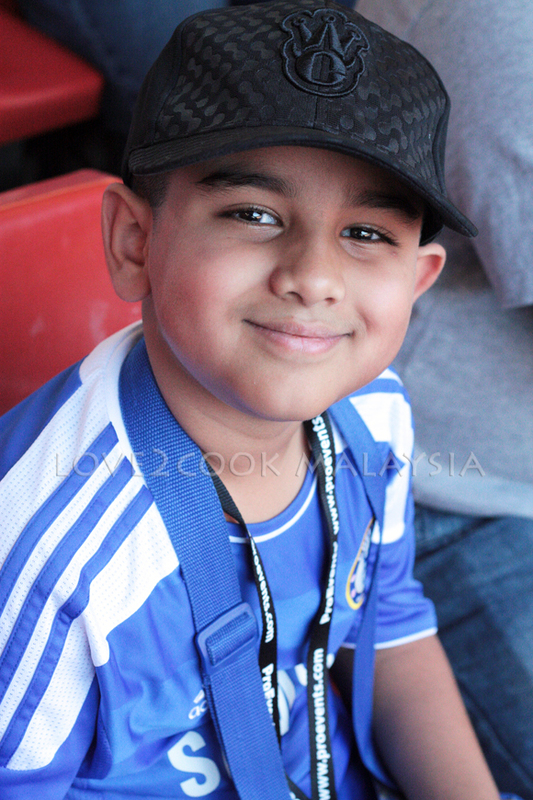 Our son, Rishie, a Chelsea fan in the making went along to the training session. 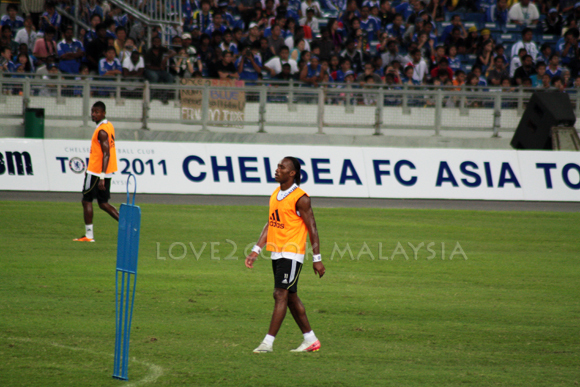 Here are few photos from hundreds of pics taken on both the training and match day...hehe! Gotcha!!! 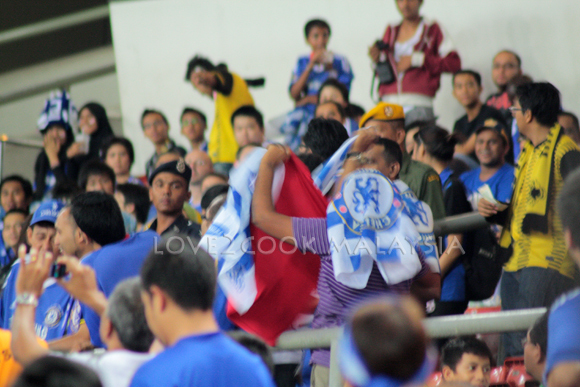 Someone's Arsenal Jersey being stripped off! 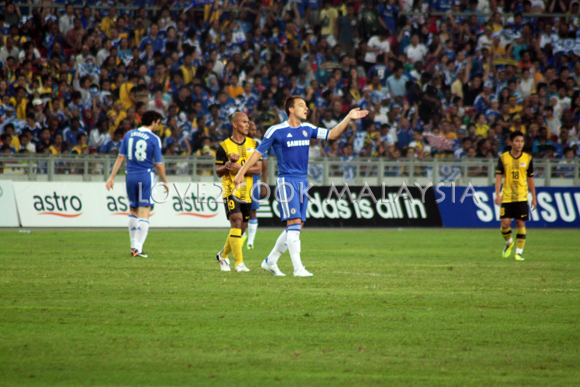 Well done Chelsea FC and Malaysian Team! Okey, now moving on to the Bees!!!! Happened last Sunday...once we returned home from a vacation. A huge colony of bees were making our shoe cabinet their new home. Rishie opened the cabinet and ran inside the house saying he got bitten by an insect and there were lots of them near the cabinet. I immediately shut the main door, looked outside the house and saw bees!!! They flew back to the shoe cabinet after 10 minutes of roaming. Thank God, Rishie was alright as no stinger left. Just the sting mark and little swelling, that too disappeared the next day. 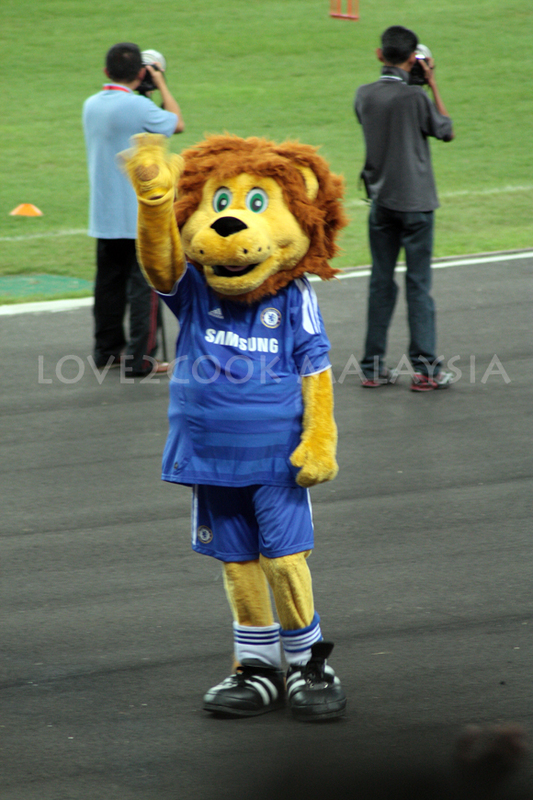 Hubby quickly called Bomba (Fire Brigade) for help as other pest control companies were closed on Sunday. They informed us not to go out from the house and that they could only come over in the night. This is because the bees will be inactive in the dark. We also kept enough bottles of aerosols for them. We stayed inside until the Bomba team from Sri Andalas, Klang arrived in their brigade vehicle around 9:45pm. There were about 5-6 of them. The bees, not at all aware of the surroundings, end up killed in the mission. Pity, but nothing else could be done for ours and neighbourhood safety. Once the fire brigade left, we cleaned up the entire cabinet just to ensure no more bees. Hubby worked the most as I was feeling little uncomfortable after seeing the bees. Just felt like something bugging me all the time....lol! Anyways, we'd like to thank Pasukan Bomba dan Penyelamat Sri Andalas, Klang for their time and quick action in getting rid the bees colony. TERIMA KASIH!!! Unfortunately, we couldn't snap any pics during the mission as we had to stay inside the house with all doors and windows closed. This only picture was taken from quite a distance by Hubby in the evening. Thank God nothing happened to our boy. Can't imagine how it would have been if he got stung by more bees. Luckily he was fast enough to run inside the house. Thanks for being here, have a wonderful day! Hi Love,patut la senyap jer rupanya g bercuti!..wah1trujanya HB Love snap gambar pemain pujaannya yer. 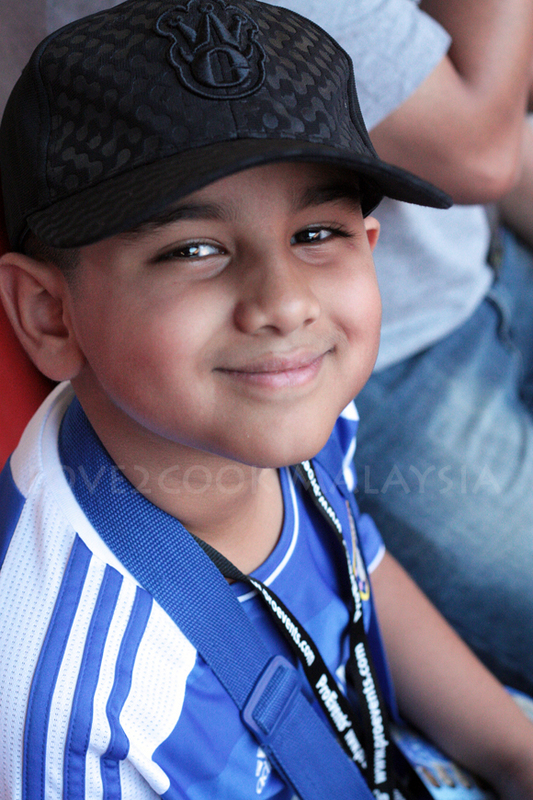 Wow you Hubby surely have cherish the moments as Chelsea Fan...and Little Rishie surely will never forget the GREAT moments spent with DADDY!And I am sure you had your special moments too when he is around....hehehe! Oh dear, that's really lots of bees.... thank god nothing happened to Rishie. ohoho... i hope 'they' will never come back. Ijan ~> Hi Ijan, hru, hubby and Mikael??? Owh yes, such a nightmare on that day...Rishie was lucky! H, here returning the favour.Thank you for visiting me. Alhamdulillah your son was safe. Bee's sting could be fatal. Glad to see the Rishie is OK! The bees really are creepy when they are in their nest! Urgh....! My niece got stung by one last year and had to go for a jab, the bees made a nest in a coconut tree nearby her house. Bees can be deadly for sure! Check for signs outside the house too. I saw a beehive last week around a cable wire! ??? Happy that your son is Ok .
nice pictures...and those bees..omgd they are creepy! Glad to know ur son is ok and hey have happy times now that ur hubby is around ! I loved the sicilian orange cake too much ! Glad your son is ok.Football games are so much fun to watch with family. Woo, luckilly managed to get rid of all the bees! oh god.. that WAS scary!! Thanks for sharing the pics :) Your kid's smile is too cute! Smart boy! WOW.. Thats super crazy.. glad ur son is ok.. Thank God your so is well.Enjoy yourself now we are always around.